I have had the most pleasant week’s recuperation… even though I’ve been doing a lot of my own work for auditions and rehearsals for the choir concert, it has been lovely to take it easy at home for a while. I finished my Owls yesterday but have done no sewing in of ends simply because I cannot find a darning needle! It fits great and will show modelled photos when I get it finished off. Here’s the Lace Ribbon Scarf I was telling you about. It finally finished off drying today and looks lots better having been blocked out. This took one skein of the Noro Silk Garden Sock. And! My most fun (if a little bizarre) news is that I have gotten the loan of a concertina. I had been thinking about it and found one in the area in the Buy and Sell… but then a friend of my dad’s offered the loan of theirs to try it out. There are many things I like about concertinas. They are small, portable, have a great range, are very expressive, and best of all: they are hexagonal. I don’t know why that pleases me so, but it does. Maybe it is due to all those hexagons I crocheted before Easter? Anyway, I am honking my way around on it this evening but will have to tear myself away for a while. My dad and I are going to a table quiz to raise money to build houses in Africa. Should be fun! Sorry about the prolonged silences. Things have been a bit mental over the last few weeks. March brought Dublin Feis (a feis is a festival of competitions) – I was accompanying a few singers I know and competed in the Senior Piano Duet competition, as well. The latter was truly only for fun. My partner was a guy I know from the Academy – we could rarely get through the piece (Mother Goose suite) without cracking up. We won, in the end, which was funnier still. Easter brought Sligo Feis and like last year, I was accompanist for all the vocal competitions. It was a heck of a lot of work but enjoyable, by and large. If you go back and read the post that I linked to, you’ll see that I mentioned applying to various accompanist training courses. I finally got my act together and got the last of two applications sent off in the post yesterday. Of course, I have yet to do the auditions (one in June, one in July). I can’t make any plans until I know the outcome of them. Even though the Feis was last week, I am still down in Sligo because I am playing for the Moy Singers. We have rehearsals throughout this week culminating in a spring concert this coming weekend. No rehearsals tonight so I am taking it easy today! Here’s what I’ve been working on. 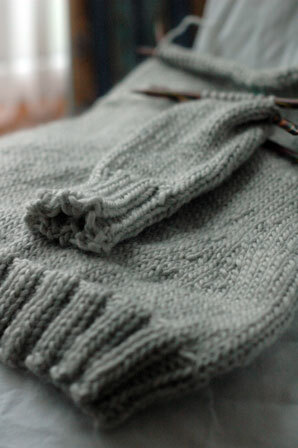 The last few days – prompted by the super weather we’ve been having here in the West – I have been mostly working on Delphine from ‘French Girl Knits’. 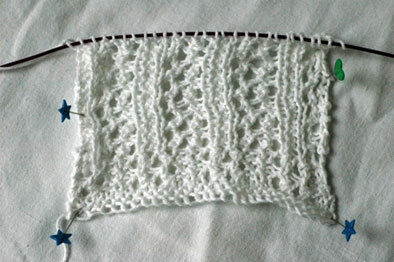 This is just my swatch but I have about 20cm knitted by now. The pattern calls for a DK yarn but I am using a 4ply cotton (an absolutely enormous ball of about 650m from Bendigo Woollen Mills in Australia!) and knitting the largest size. So far it seems to be coming out as expected. The fabric is a very stretchy lace so size isn’t that crticial (I hope!). For the days when it rains and those cool April breezes blow, I take this out… the now famous Owls sweater. I’m knitting it in Rowan Coccoon on 7mm needles and despite not knitting on it very much, I have a sleeve and a half and the body worked up to the armholes. I finished a lovely Lace Ribbon Scarf in Noro Silk Garden Sock but I will talk about it another time – I still need to block it. PS – I applied (what feels like) ages ago for funding to put on a small chamber music concert in August and I came home to the good news that enough funding was granted for the project to go ahead! On the agenda is a Quintet concert (oboe, clarinet, bassoon, french horn, piano – all of us mates) and a piano concerto concert (with Sligo Baroque orchestra from Sligo town – a great bunch to play with!). Very exciting! PPS – I still haven’t heard back from the hosting crowd I applied to for a site for the Guild.